Avtek Solutions are delighted to have secured the contract to undertake the Specialist Façade works for the multimillion Barony Campus project in Cumnock, deemed ‘Scotland’s most innovative and ambitious community learning project’ by East Ayrshire Council. The creation of the state-of-the-art campus which will incorporate 5 existing schools into one, as well as provide further education, sporting and enterprise facilities, is expected to cost in the region of £68m and due for completion in summer of 2020. For Avtek Solutions, this means more than providing curtain walling and glazing solutions. As Façade specialists, Avtek have also been commissioned to design, manufacture and install aluminium brise soleil to help reduce solar glare and prevent the building from over-heating. 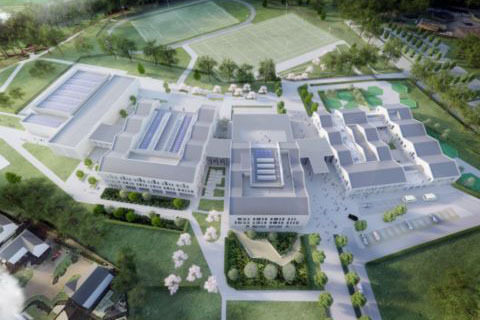 As part of the Scottish Government’s “Scotland’s Schools for the Future programme”, the Campus has not only been designed to create the ultimate learning environment but also provide the most modern facilities to benefit the wider community.